Iâ€™ve spent the last two growing seasons testing out different ways of starting seeds indoors so theyâ€™re all ready to pop out into the garden once it warms up under the spring sun. Last year I tried making little pots out of newspaper using this tutorial, but I found that the soil dried out much too quickly because it was evaporating through the paper shells. Then, as I was making breakfast it occurred to me that I could use all these eggshells I had piled in the compost bin as natural containers! Newspaper has harsh chemicals from the paper making process and the inks which makes them less than ideal for your wee plants. Eggs, on the other hand, are already cup-shaped, theyâ€™re made to retain liquids, the naturally â€œbreathâ€ a little bit and they compost right into the ground around your plants which provides them with a little bit of nourishment as they grow. It canâ€™t get much better than that! 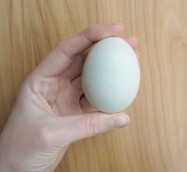 Pick up a dozen organic, locally produced eggs. As you use them to bake tasty treats, make sure you crack each egg towards the pointy top. That way youâ€™re left with the more bulbous base and Â¾ of the eggshell intact. Discard the pointy top. 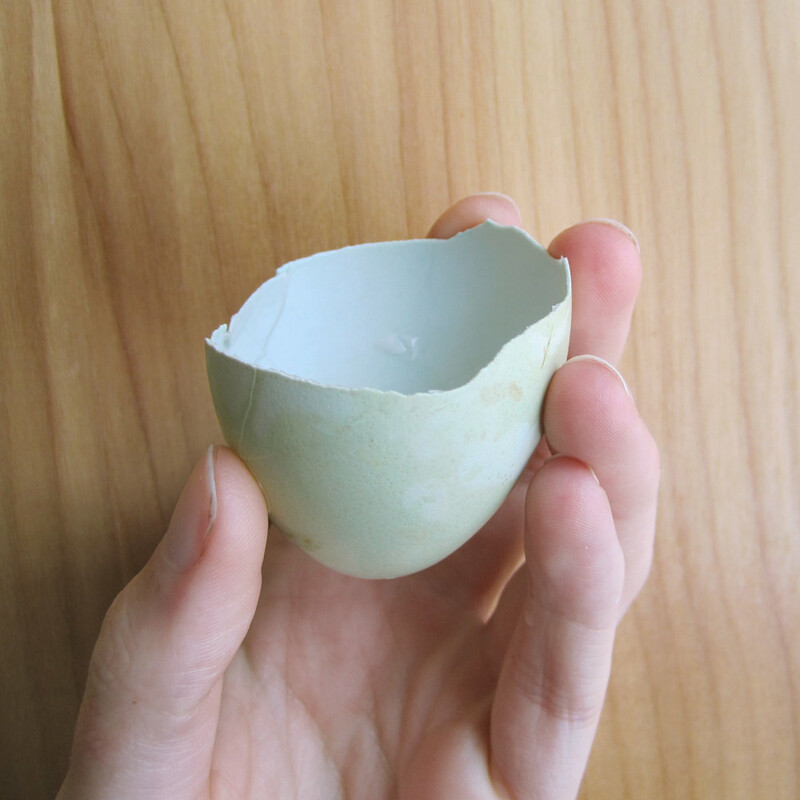 Use your fingers to pick off and jagged pieces to neaten up the edges of your shell. 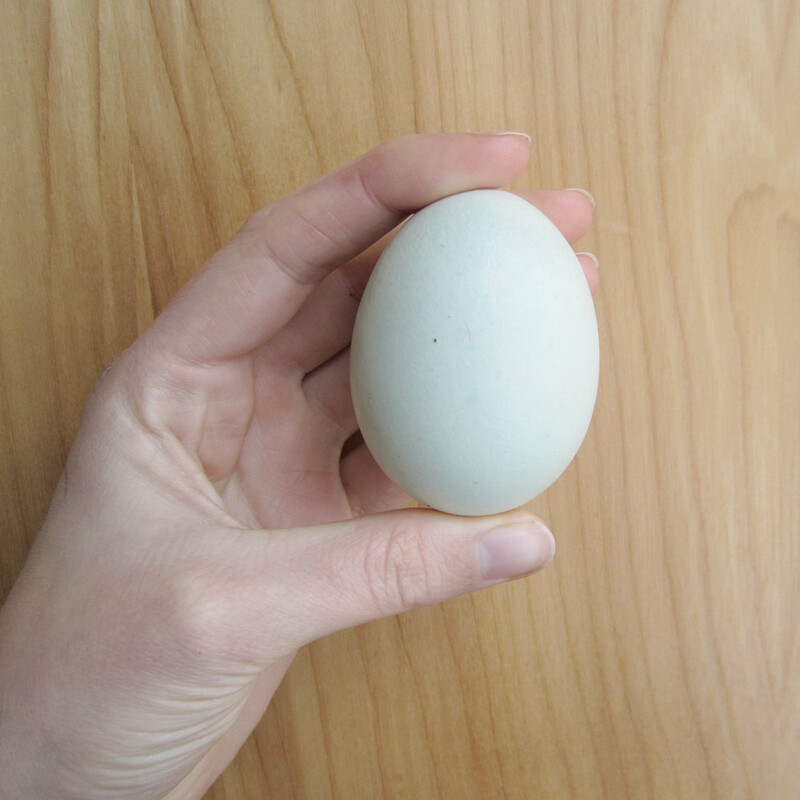 While the egg is still fresh, take a large sewing needle or pin and carefully poke four-six holes in the base of your egg. This will allow excess water to drain. Rinse the egg and pop it into your empty egg crate. Once you have a full dozen (or however many you need) go ahead and spoon in some potting soil/dirt into your eggs. Make sure to leave Â¼ inch between the dirt and the top edge. It will make watering the starts easier in the coming weeks. Follow the directions on your seed packets and plant your seeds in the soil. I planted basil and put four-five seeds per egg. If youâ€™re starting something sturdier like squash or beans I would suggest only planting 1-2 seeds per egg or theyâ€™ll crowd each other. As you plant each variety, make sure to label the eggs so that you know exactly whatâ€™s growing and where. 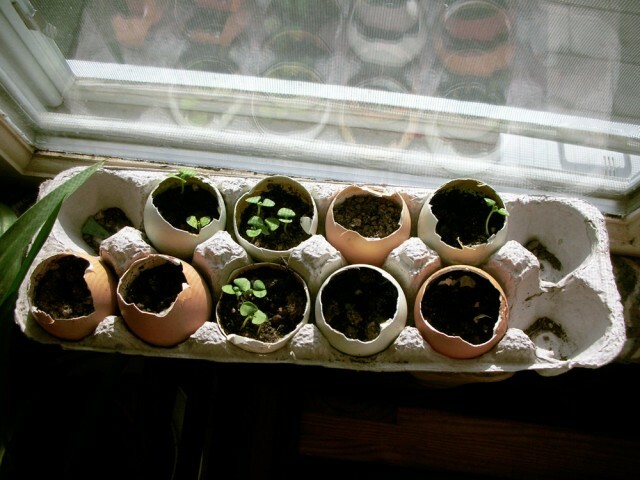 I planted my basil in the blue shells and cilantro in brown shells, you could also write on each shell with a pencil or make little markers out of toothpicks and strips of paper. Find out which method suits and label away! 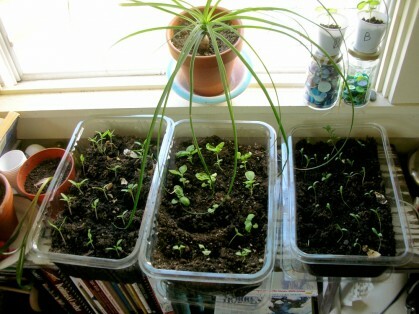 Go ahead and water your seeds with about 1 tablespoon of water and put them in a nice, sunny window. Continue to water your seeds, letting them dry out in between waterings. Now, just sit back and relax! Your seeds should germinate within the timetable printed on your seed packets. Over the next few weeks your wee plants will start to look crowded. They’ll eventually outgrow their shell homes and will need to be transferred to an intermediate container before they’re big enough to go outside. I took two plastic salad containers (the kind pre-washed salad mixes are packaged in at supermarkets), punched about a dozen holes in the bottom for drainage and filled them 2/3rds of the way with soil. Just before the starts developed their first adult leaf I gently crushed the egg shell in my hand… just enough so that it wasn’t so confining and could allow more water to drain. Then I dug a shallow depression in the medium container and placed the egg inside. You’ll want to make sure that the top of the egg shell is even with the top of your soil. 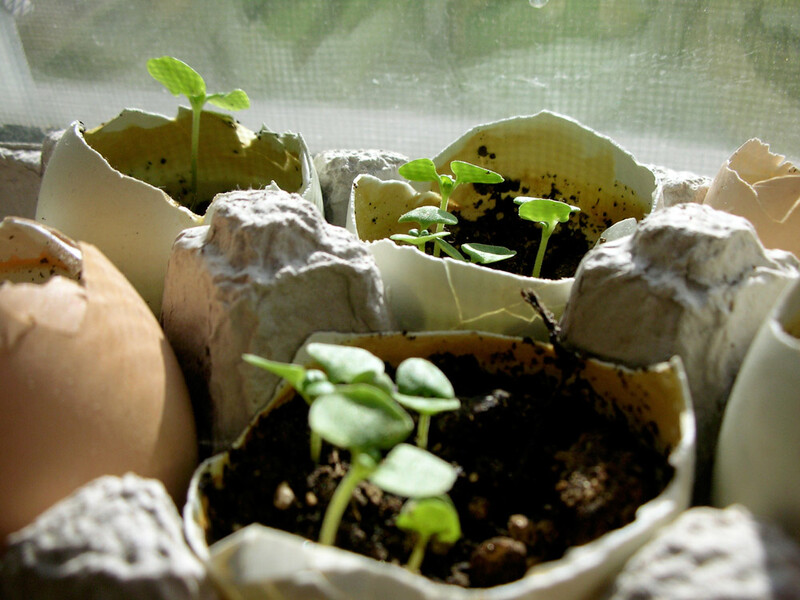 Even place all of your eggs in the medium container, thinning out weaker seedlings in the process. Eventually you’ll notice that your seedlings need more space, continue to transplant/manually space out the seedlings in your containers until it’s time to transplant into the garden!